Throwing the Switch! - Meguiar's NEW Discussion Forum! Thread: Throwing the Switch! 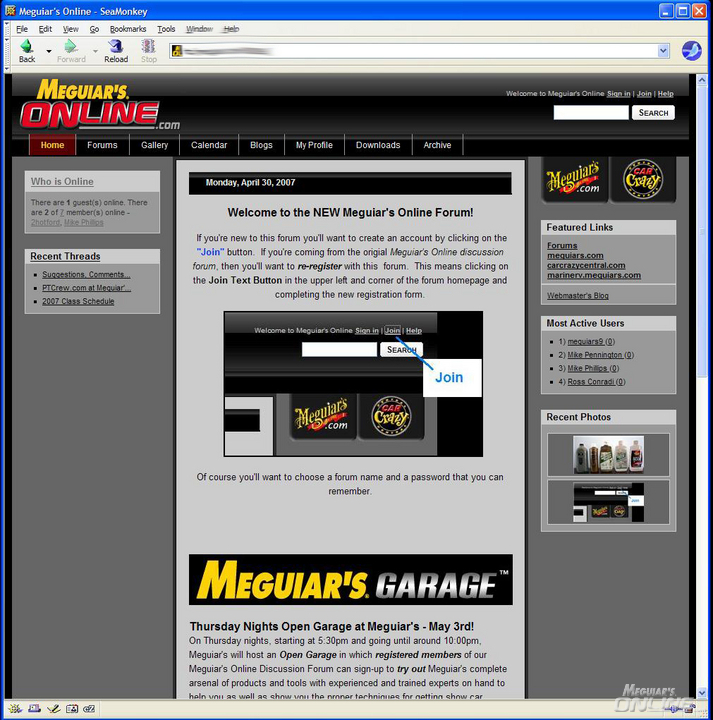 - Meguiar's NEW Discussion Forum! Here's a screen shot of the new forum with a text caption added to show you where the location of the "Join" button is. This would be the same as a "Register" button on our current forum. We're going to post the link sometime this evening, after we make a few more tweaks. So keep an eye on this thread. It's important to prepare yourself for change. The new software is different from the current vBulletin software. It will take a little getting used to especially if you used to and comfortable with vBulletin style forum software which on a personal note... I am. So I'm also learning how to interact inside of this new interface as well as learning how to exploit all of it's features. The DNS or Domain Name Servers are going to be switched tomorrow an 12:00 Noon. That means as the change propagates over all the Internet Servers in the world, when you type www.meguiarsonline.com into a browser the new forum will start pulling up. Sometime after that the existing MOL forum will be switched over to Archive mode. This means you can read information on the old forum but you will not be able to start a new thread or reply to an existing thread. Looking forward to seeing you on the new forum! Over the next few days and the next few weeks a lot of changes will be implemented into the new forum so have patience as we warm up the engine before standing on the pedal. Re: Throwing the Switch! - Meguiar's NEW Discussion Forum! Cool! Any particular reason MOL is changing over to new software? Can't wait to see whats new. I am sure there has been plenty of work behind the scenes! Trust me...it is REALLY cool!!!! We have made the decision to change to new discussion forum software that promises to bring more benefits and features to our forum community as well as be less prone to being hacked into. Since going live in 2004, the first Meguiar's Online Discussion forum running vBulletin software had been hacked 3 times. This new software is still brand new to all of us so please be patient and spend some time exploring the new interface. In the meantime we will be adding Video Tutorials to show you how to interact on our new forum. One of the first posts we created is for PTCrew.com to sign up for their class! On behalf of myself and the boys at PTCrew.com...........(in the voice of the old Bud Light commercials) we love you man!!!! Getting to late to do this tonight so we'll post the link to the new forum sometime tomorrow morning. Are "you" running OpenBSD? It's clear that there has been A LOT of time spent on this and a good foundation for me when redundancy is an issue is to use OpenBSD. The rolls in the download section is gorgeous!